A number of years ago I had an epiphany of a sort and realized that eternal life doesn’t begin the instant we pass from this world to the next it begins when through the Holy Spirit Jesus takes up residence in every facet of our life. 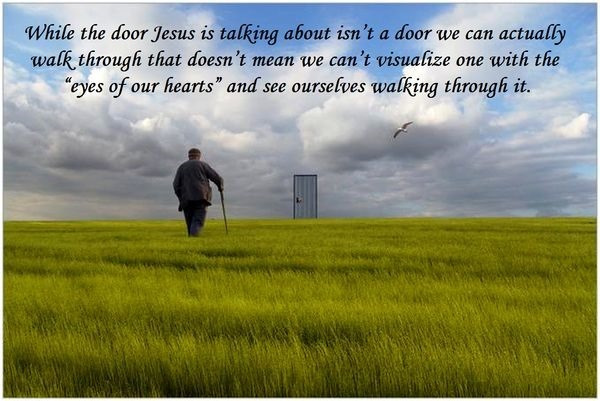 I believe with all my heart, mind, and spirit God’s ultimate goal for Jesus’ participation in this world and specifically in each of our lives is and was to personally open the door of eternity so we can walk through it. Jesus himself introduces us to the door of eternity in chapter 3 of Revelation. So many times over the course of my life those 22 words have echoed in the hidden reaches of my life. They have been both a blessing and curse, challenging and accepting, illuminating and darkening, healing and afflicting, comforting and conflicting. And with each succeeding year they become increasingly more intimate and life shaping. That became more apparent this thre years ago as I underwent artery by-pass surgery, had a near fatal heart attack then this past December it was discovered all four of the arteries that were grafted have sense closed off 100%, and now in addition to pulmonary fibrosis I have been diagnosed with prostate cancer. It has been commonplace or me in my prayers to pray, “Well God, what next?” There is of course only silence on God’s part but I suspect if I could see his face he’d be smiling. For me the greatest lesson of Holy Week and Resurrection Sunday is “It’s all God or nothing!” On the cross the human Jesus died. Yet because the Holy Spirit had given Jesus Life the Jesus that exited the tomb was the Spiritual Jesus. In a like manner whatever form the “Grim Reaper” puts an end to the human Gary Piper because I am a child of the Resurrection the Gary Piper who exits my deceased body will be the Spiritual Gary Piper. However, since I am a child of the Resurrection and I get “God and everything” the things I am trying to escape listed above rather than being adversities and burdens become instead links in a chain that anchors me to God. I would be less than honest if I tried to say I greet all the difficulties life throws at me with a smile because even though God has been making lemonade out of my lemons for years I still cringe when something or someone hands me another batch of lemons. Erre, Mike (2014-04-01). Astonished: Recapturing the Wonder, Awe, and Mystery of Life with God (pp. 23-24). David C. Cook. Kindle Edition. Erre, Mike (2014-04-01). Astonished: Recapturing the Wonder, Awe, and Mystery of Life with God (p. 24). David C. Cook. Kindle Edition. Yes, I believe trials and growth are hand in hand, they caus us to move from beliving in Jesus to beliving Jesus?